These kits feature laser cut wood underframes and sub-structure, metal, cast resin, injection molded plastic, or engraved Laserboard sides and body components as appropriate, and metal, plastic, or cast resin detail parts. Kit assembly is easy enough for the beginning modeler but interesting enough for the experienced craftsman. 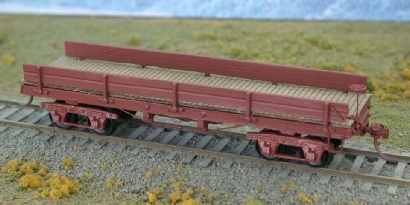 When completed you will have a unique piece of rolling stock that you will be proud to run on your railroad. All cars shown are of prototype cars that existed during the late 19th and early 20th Century. Great care has been taken in the research of each car to ensure it’s accuracy, both in detail and appearance as substantiated by plan or photo. Some information, such as body and lettering color, must be left to conjecture or “best guess” approximation. If anyone has corrections, comments, information, or photographs regarding these cars we would enjoy hearing from you. This kit represents the basic 36’ boxcar used by railroads throughout the country during the 1890’s and early 1900’s. As such the basic car body details may be modified to lend variety to one’s car fleet or to more closely model a specific prototype. The kit has laser cut wood underframe and internal structure, the roof, sides, and ends are cut from Laserboard with all grab iron and NBW holes pre-drilled, and it is finished with cast metal and plastic detail parts. The kit comes less trucks, couplers, and decals. The late 1880’s saw the popularizing of the convertible type gondola, sometimes called a high side flatcar. This one differs from others in that it features lift end gates. Also note the use of Commonwealth cast pedestal bars. This kit features laser cut wood underframe and decking, cast metal end sills, sides, end gates, bolsters, center beam and pedestal bars, with plastic detail parts. 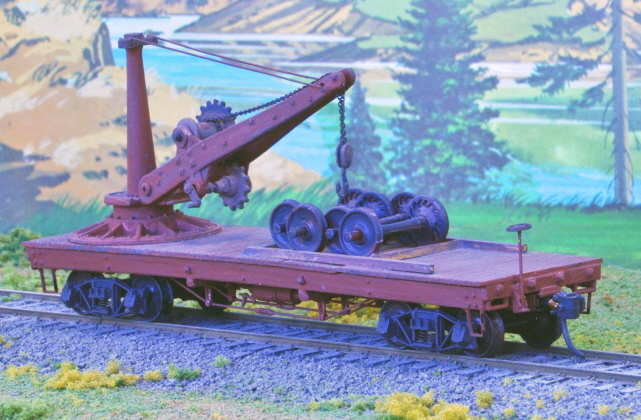 The 36’ flatcar was commonplace on railroads and generally made up the backbone of the road. They were used to carry most any commodity regardless of size or shape. This kit uses laser cut wood underframe and decking, cast metal sides and end sills, bolsters and pedestal bars, along with plastic detail parts. This kit represents an “armstrong” type derrick car used in wreck service in earlier times but later relegated to MOW as equipment got heavier. The kit uses laser cut wood underframe and decking, cast metal sides and end sills, bolsters and pedestal bars, along with plastic detail parts. The derrick is made up of metal and turned brass parts. Comes with four Tichy plastic wheelsets for added detail. 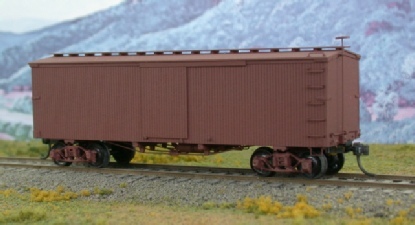 This is a kit of a 34’ boxcar typical of the type used from the 1880’s into the 90’s. The kit has laser cut wood underframe and internal structure, the roof, sides, and ends are cut from Laserboard with all grab iron and NBW holes pre-drilled. It is finished with cast metal and plastic detail parts. 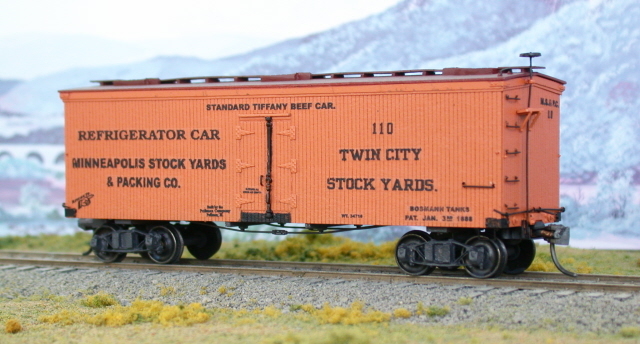 The Tiffany Patent 34’ refrigerator car was a great improvement over the earlier 28’ Tiffany reefers and was used by a large number of railroads and private owners. 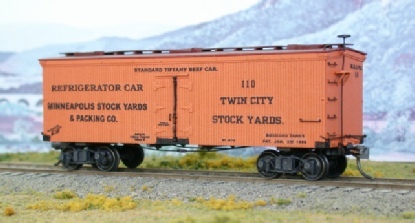 This kit represents the eight cars that were built by the Pullman Company in 1890 for the Minneapolis Stock Yards & Packing Company. The kit has laser cut wood underframe and internal parts, Laserboard sides, ends, and roof, with cast metal and plastic detail parts and comes with decals for the MS&PC. The kit comes less trucks and couplers. 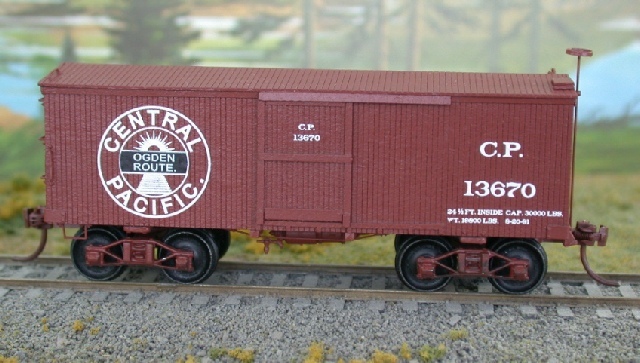 This kit represents the earliest series of boxcars built by the Central Pacific Railroad. This 25’ 15 ton capacity car was built in the C.P. shops during the railroad construction era in the 1860s. 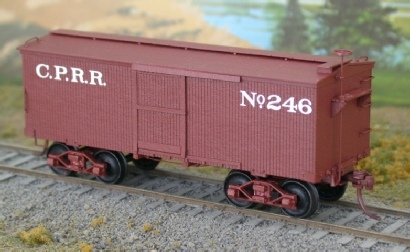 In the 1880s changes were made to the cars including replacing the original tin roof with a double-board roof, removing roof walks and end brake platforms, adding a small lumber door to one end, and installation of air brakes. 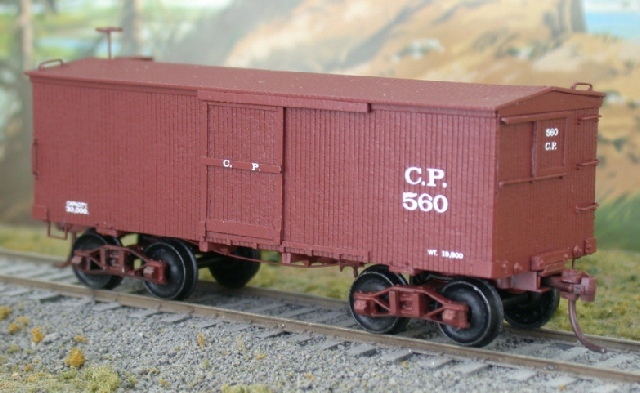 In 1891 the cars were re-numbered and re-lettered with a large CP “Ogden Route” herald. In 1899 the herald was changed to read “Southern Pacific”. The kit has laser cut wood underframe and internal parts, Laserboard sides, ends, and roof, with cast metal and plastic detail parts. Decals and alternate parts are included to make cars for the construction period, the 1880 rebuilds, or the 1891 renumbering. This kit contains parts to build two old-time 4-wheel coal hoppers of the type common in the mid 1800's. A wide variety of such cars were developed to move coal to market and such midget rolling stock lasted in service with many railroads until the early 1900's. 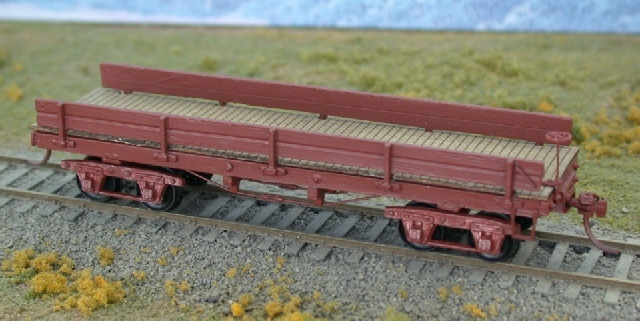 This kit is made up of a wood underframe and cast metal parts. The kit comes less decals and couplers. The thirty-two foot flatcar was commonplace during the early era of railroads and made up a large portion of the roster. 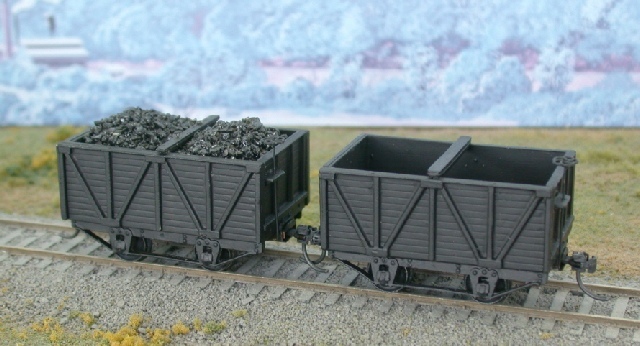 They were used to carry almost any commodity including coal, rock, and other loose materials. As originally built these cars were not equipped with automatic airbrakes. This kit uses a laser cut wood underframe, laser cut wood decking, cast metal end sills, sides, truck bolsters, and pedestal bars.